Until this weekend, Quentin Tarantino’s The Hateful Eight was a textbook example of the stages of Hollywood catastrophe: hopeful beginnings, betrayal by agents, angry calls to Deadline, a public feeding frenzy, and finally, a lawsuit against Gawker Media. Tarantino’s intended follow-up to Django Unchained seemed destined to end up on the shelf with Welles’ Heart of Darkness and Kubrick’s Napoleon: fascinating movies that never quite made it to the screen. 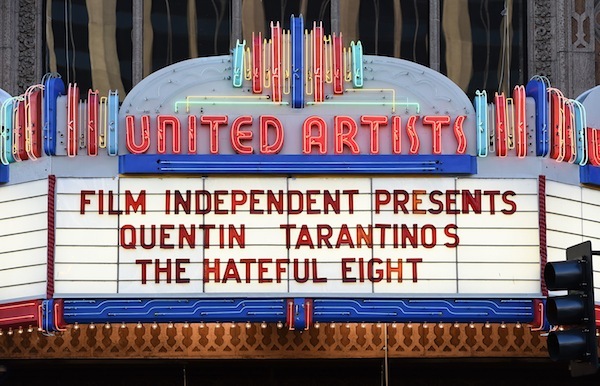 But even though Tarantino ostensibly hadn’t changed his mind about not filming The Hateful Eight, he announced at the beginning of April that he would cast and direct a live-reading to benefit LACMA and Film Independent. It wasn’t the first live reading Film Independent has arranged at LACMA: Jason Reitman has been directing live readings of screenplays of classic films since 2011. But a live read of a film that already exists is a different thing entirely than what might be the one and only opportunity to see a director present a lost project. And when they said “only opportunity” they meant it: The event would not be filmed or recorded for posterity. No cell phones or electronic devices of any sort would be allowed inside—no live tweeting or bootlegs. There would be one performance, one night, and you could either be in the room or not. Tickets were priced accordingly, from $100 to $200. A lot to pay for a theater ticket, but pretty cheap for a place in film history. Outside the theater was a long line of people who had forgotten or ignored the absolute prohibition on cell phones or recording devices, checking their electronics at a folding table set up on the sidewalk. (After the event, the line to reclaim phones stretched down the block all the way to Olympic.) On the other side of the metal detectors, the stunning interior was packed. As with most events in the city that invented “Creative Black Tie,” the attire was all over the map, from impeccably tailored suits and dresses to jeans and flannel shirts. There was at least one leather trilby worn indoors, a cream linen suit with matching cane, the classic stringy gray ponytail/Canadian tuxedo combination, and ersatz identical twins with matching hairstyles, sailor pants, and crop tops. Also sighted (separately): Jeffrey Wells and Peter Bogdanovich. In the inner lobby, a portable bar sold bottom-shelf liquor at middle-shelf prices—and Bugles, for some reason. The actors, all Tarantino veterans, were greeted with roars, particularly Russell, Roth, and Madsen. It’s rare to see so many film stars in a lineup without camera angles or apple-crates: In person, Roth is tiny, Goggins is thin to the point of being wraith-like, and Madsen is not just tall but seems to be some kind of larger-than-life scale model of a human being. As a medium, a script live-read is not that different from Lux Radio Theatre. Tarantino performed the stage directions himself from the podium. There’s definitely a qualitative difference between an actual 70mm image and Quentin Tarantino enthusing about “big super CINEMASCOPE 70MM filmed gloriousness,” but they both have their charms. The script is set at an unspecified time shortly after the Civil War. Russell, doing a pretty good John Wayne, played John Ruth, a bounty hunter transporting a sullen hostage (Tamblyn) across Wyoming on a stagecoach driven by O.B. (Parks). As the story opens, they offer a ride to an African-American bounty hunter, Major Warren (Jackson), and Chris Mannix (Goggins), the new sheriff of Red Rock, as they try to outrun a blizzard. Warren is a former Union Cavalry officer notorious for burning Confederates in a prison escape; Mannix is the son of a William Quantrill-type guerrilla; Ruth just wants to get paid—there’s not a lot of camaraderie. Things don’t improve when the group arrives at at Minnie’s Haberdashery , a stagecoach stop outside of Red Rock. Instead of Minnie, they find a Frenchman named Bob (Ménochet), a slightly foppish Englishman named Oswald Mowbray (Roth), a nearly silent American cowboy, Joe Gage (Madsen), and an ancient Confederate General (Dern) waiting out the storm. Once the Hateful Eight (I count nine, but the stagecoach driver isn’t particularly hateful) are trapped by the blizzard, the script’s true genre reveals itself—not a Western at all, but a drawing-room mystery. People start getting murdered, secret histories are revealed, lies are unraveled, and there’s a version of the scene where all the suspects gather as the detective explains who’s responsible. It’s still more Tarantino than Agatha Christie: That drawing-room scene involves Russian Roulette. If The Hateful Eight does become a film, we can look forward to another round of the same debates people had about Django Unchained. 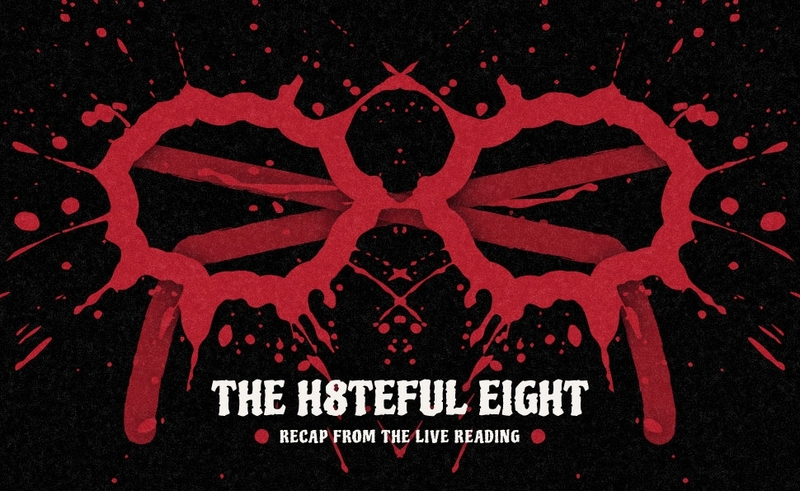 Tarantino seems to be looking forward to this: The first time the director’s most frequently used racial epithet appeared, he interrupted with, “DING DING DING DING DING!” and pointed out, for those keeping score, that we were on page seven. And people who didn’t appreciate him giving slavery the exploitation treatment will probably not be thrilled that he’s evoking Fort Pillow. Of all Tarantino’s scripts, The Hateful Eight is the one most suited to a live-read, despite the repeated reminders that it’s to be shot on 70mm. Although the opening shot is of a tiny stagecoach crossing an immense Wyoming landscape, it’s mostly set in enclosed spaces: the cramped interior of that stagecoach and a claustrophobic, overcrowded cabin. Now that it seems bound for the screen once again, it will be interesting to see what Tarantino does in such tight spaces. With a few tweaks, it could be staged as a play, which was basically what happened. The draft the cast worked from wasn’t exactly the version that was leaked—beyond minor polishing, Tarantino made one structural change, a flashback that makes a bit of business with a fateful cup of coffee more obvious. On film, the change might be needed, but in the live read, with Tarantino pulling a blue percolator—one of the production’s only two props—out of the podium to brandish whenever it was mentioned, it seemed like painting the lily. Tarantino provided makeshift sound effects by banging on the podium, and generally seemed to be having the time of his life. The cast was relaxed and easy, especially Jackson. The crowd was appreciative, and there was a certain amount of mugging, particularly from Goggins—who gave an excellent performance but couldn’t help grinning at the reaction he got from the audience. Dern was exceptional and Jackson did his Samuel L. Jackson thing. As in many Tarantino movies, most Westerns, and (so far) all Tarantino Westerns, the women weren’t given much to do, but Tamblyn was suitably cruel and mean. And Tim Roth deserves some kind of a medal for gamely playing a role that was clearly written for Cristoph Waltz—Oswald is described repeatedly as blonde. The logistics, it must be said, were not smooth. There was some confusion as to when the intermission was—a sizable portion of the audience wandered off when the chairs were rearranged to represent Minnie’s Haberdashery. The real intermission—15 minutes, during which Elvis Mitchell could be seen in the alley with the kind of cigar that takes an hour to smoke—ended with little warning, so the beginning of the second half was punctuated by conversation from the lobby and people shuffling back in. (Tarantino stopped mid-sentence to shush the crowd.) And with any luck, the theater management has sorted out for next time the reason most live theaters don’t sell crunchy snacks wrapped in crinkly tinfoil. Some of the seams showed in the performance as well, a consequence of limited rehearsals and a director more used to film. During the first act, Tarantino had interjected a warning to the cast to stick to the words on the page. This seemed like a pre-planned joke until later, when he started asking actors to repeat their lines or restart scenes—fine on a movie set, but not the best approach to with a live audience. A few times this was clearly necessary, as actors lost their place or skipped pages, but most of the time there wasn’t much difference between the first and second takes. After racing across the stage to whisper something in Samuel L. Jackson’s ear, Jackson told the audience, “He’s directin’.” But at the very end, Tarantino lost himself in the story. During one exchange of gunfire, he made finger-guns and pointed them at each other, working the thumb-hammers and hollering “BANG!” with each shot. In that moment, in his cowboy suit and bandana, you could see him: a kid, with millions of dollars and the best actors in the world, playing guns.